The members of the Intl. WeLoveU Foundation, who do not overlook global neighbors’ concern, took the lead in helping climate refugees in Bangladesh, India and Nepal this year. 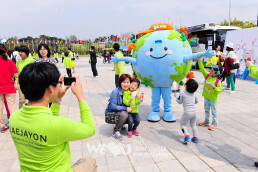 On April 28, the 15th New Life Family Walkathon was held in Olympic Park in Seoul under the auspices of the Intl. 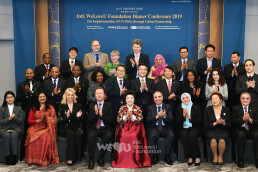 WeLoveU Foundation in cooperation with the Ministry of Health & Welfare, Seoul City, IUCN Korea Council, Korea Energy Management Cooperation, Green Start, AIESEC, and Korea Youth Hostel Association. 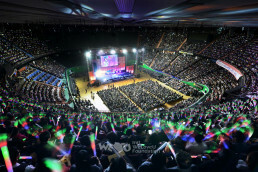 About 12,000 WeLoveU members living in Seoul gathered. Chairwoman Zahng Gil-jah, Sponsor Chairman Lee Sun-jae (actor), members of the Soul Diplomatic Corps. such as Amb. Margaret Clarke-Kwesie of Ghana, Amb. Carlos Victor Boungou of Gabon, Amb. Mohamed Ali Nafti of Tunisia, Deputy Head Mission Raja Ram Bartaula of Nepal, and Counsellor Harry A.C. Van Woerden of the Netherlands Embassy as Head of NFIA (Netherlands Foreign Investment Agency), and Seo Young-bae the Head of Korean Council of IUCN, Kim Hee-sung the Director-General of Green Start, Shin Yong-woo the Director-General of the Korea Youth Hostel Association, Lee Bae-geun the President of KAPCAN (Korea Association for the Prevention of Child Abuse Network) also participated in the walkathon. 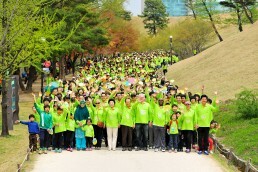 The 15th New Life Family Walkathon was held in the Olympic Park. 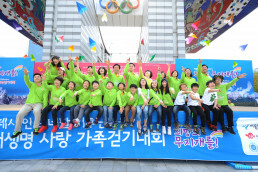 The New Life Children’s Choir cheerfully started the celebration performances around 10 a.m. Following environmental songs by Green Plus, a group of university student environmentalists, urging people to take action against environmental problems and practice environmental protection methods in life, the military band and the tri-service honor guard of the Ministry of National Defense performed. They gave a restrained and powerful performance, making various formations, and it shows the spirit of nation’s forces elevating nation’s dignity. 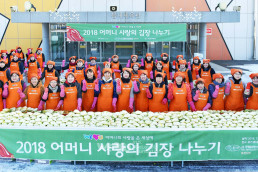 Sponsor Chairman Lee Sun-jae (actor) complimented the members’ efforts that has given to their global neighbors and said, “You have rights to be blessed. 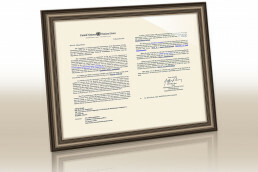 You are qualified.” Seo Young-bae the Head of Korean Council of IUCN said, “Our planet is getting hotter due to car exhaust emissions and carbon dioxide, but walking is the most important and easiest thing to do to reduce CO2. I hope today’s love sharing will bring peace to the earth and today’s walkathon will prevent global warming and become the first step to save the earth.” Counsellor Harry A.C. Van Woerden the Head of NFIA also hoped that the event will be of help to climate refugees and it will save the life of many people so that they can have hope and courage. And POPs promising the support of water pumps, daily necessities and medications delivered to Bangladesh, Nepal and India. And around 3,000 money boxes that the members brought to help climate refugees in these countries were piled up beside the stage. After the donation ceremony, the 2nd part walkathon started with the marching band performance. 12,000 members who are in fresh green T-shirts covered the trail of the park. A variety of themes along the walking course, “Let’s use stairs!” “No disposables!” “Flick off a switch,” made them share environment protection methods in life. At the Peace Square where the members started and arrived, publicity pavilion showing the reality of climate refugees with photos and eco pavilion were set up to raise awareness on environment. During the time of experience of the 3rd part, Chairwoman Zahng Gil-jah guided the guests and wrote a message of hope together with them. They experienced making T-shirts with natural dyes and natural fabric deodorants. The guests were excited to experience the human-powered bicycles the most. When the ambassador of Tunisia pressed down the pedals and the fan moved by the power, the ambassador of Gabon enjoyed the breeze from the fan and made a comical facial expression, so everybody burst into laughter. Third secretary Yulia Savelieva of Ukraine Embassy also said, “In the past, many people in Ukraine were also harmed by the Chernobyl accident. We are concerned about our global neighbors as well, and we want to actively participate in this good event.” Deputy Head of Mission Raja Ram Bartaula of Nepal who explained the difficulties of people living in mountainous area of Nepal due to climate change expressed his thanks to the WeLoveU for holding the event to help climate refugees in Nepal as well as India and Bangladesh. He hoped that there would be no more people suffering from climate change.